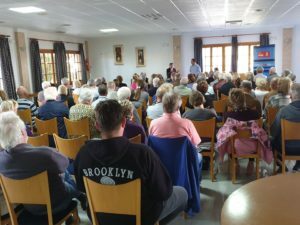 Our Honourable guest was GASPAR MIRAS LORENTE, Councillor for PSOE and candidate as mayor of Mazarron, who introduced the PSOE manifesto for Camposol and for Mazarron. Here is a translation of Gaspar’s speech. I wish to thank you all most sincerely for coming to this meeting and give me the opportunity to introduce myself, and to talk about the problems and solutions for Camposol that, if we win the elections on the 26th May, we intend to address. Please forgive me for using a translator, as I have no knowledge of foreign languages. First of all I wish to introduce myself to you all. My name is Gaspar Miras Lorente, I am the PSOE candidate standing for Mayor, I am married with two children and I live in Mazarrón. The people who know me well, will agree that I am a sincere and hard working person, available to all who seek my help, and that’s why, from this very moment, I consider myself at your service for any issue that you may wish to discuss, either directly with me, or through Silvana who is my representative and the PSOE representative for Camposol. I recognise that, for years, Camposol has been forgotten; I, personally, became aware of this situation only 18 months ago when a decision on Camposol was finally agreed at the Regional Assembly by the Commission of Investigations. Since then, I have made it my priority to get to know the problems of this urbanization, the problems of its people, and I have been doing my very best to help, in spite of not being part of the governing body in the Town Hall. A year ago the Residents Association and myself visited the Aqualia installations in the urbanization, including the sewage pumping stations, and the drinking water installations, gaining knowledge of their working condition. Following a visit to the pumping stations it was decided that those in Sector A and C were in need of repair. This requirement is taken into consideration in the Investment Plan approved by the Town Hall. Also, with the CRA’s help we are in monthly contact with Acqualia to ensure that the Works on the urbanization are done correctly and without delay – repairs that had not taken places for weeks or months are now dealt with, including tarmac on the roads and repairs to the pavements etc..
From a new PSOE we guarantee that Camposol and its residents will continue to be important to us as they have been for the last two years. We know that there is no easy solution to the problems, but we need to start working on them, and I give my commitment that we will do so. 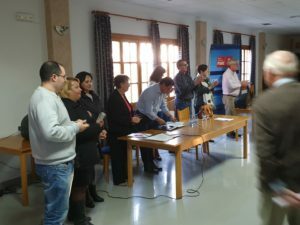 We will ensure that Camposol is no longer abandoned by the Town Hall as it has been for years; GASPAR MIRAS LORENTE, as mayor of Mazarrón, pledges, amongst other things, to abide by the decision taken in March 2018, which is to establish a dedicated Works Progress Committee formed by the Town Hall, the Regional Government, the CHS and the CRA in order to work towards a solution of the problems in Camposol. And so that nobody will ever deceive you again, you, who live here, must put all your trust in each other. Carry on being strong and support each other, and at the next election take the only path open to you, support SILVANA BUXTON – she will be your councillor in the Town Hall of Mazarrón – believe me when I say that this is your only option. I give you my promise that we will work towards establishing a Residents’ Committee in Camposol where the residents will be able to decide on how to invest the taxes that they pay. We know that the problems of Camposol cannot be resolved from morning to night, but we are convinced that unless we start… we’ll never achieve our goal. In the past months GASPAR MIRAS has been involved in your problems, he is working towards their solution, and with the dialogue and the support of all who live in Camposol, he will continue to do so if he becomes Mayor of Mazarrón. We will set up a Municipal Branch Office in Camposol, which will offer services including the receipt of documents, registration on the padrón, taxes, public information etc. This office will be manned by the Councillor for Strategy in Camposol who, with your support, I have no doubt will be SILVANA BUXTON. There will be a permanent POLICE PATROL 24 h a day, 365 days a year. We will resolve the problem of public street lights which exists in some of the streets in Camposol. We will provide green areas, parks and gardens with play area for the children. We will put into place a STRATEGY PLAN FOR CAMPOSOL, requesting that this be declared as Works of General Interest, in order to obtain the appropriate financial assistance from the Spanish Government and the Regional Government in Murcia. This plan, of multi-annual duration, will include an investment in the repair and replacement of the network for drinking water and sewage system. We’ll endeavour to resolve the problems affecting the whole urbanization, especially those affecting sectors C14, C15 and C16. A programme will be included, for the tarmac and completion of the public streets and pavements. We shall control the occupation of abandoned or empty properties, to prevent their occupation by squatters. We will work on the Project for the Redirection of the Rambla of the Aznares, and we will seek financial assistance from the State and from the Region. Finally, I want to see Camposol treated in the way it deserves, I want to see a public Bus that links Camposol with the Country Club, with Mazarrón and with Puerto de Mazarrón. 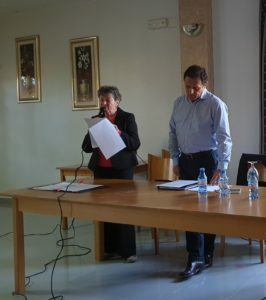 And united, we can achieve all this; I guarantee that if I become Mayor of Mazarrón, with Silvana as your representative in the Town Hall, Camposol will change.